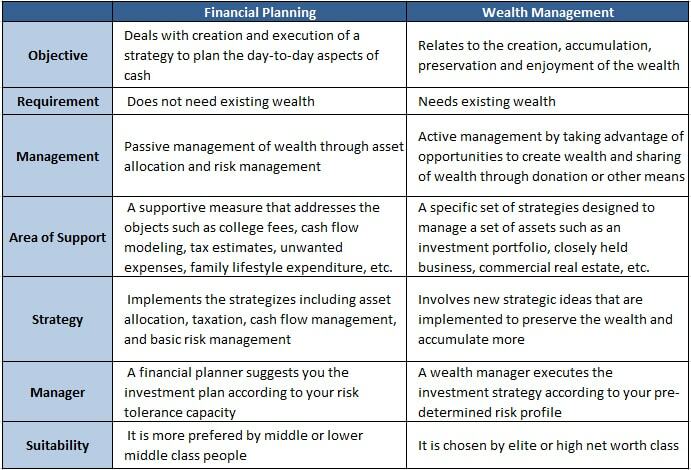 How Does Financial Planning Differ From Wealth Management? What are you looking for- Financial Planning or Wealth Management? Before taking any decision, know what is the difference between the both? Mothers at our home put in their personal efforts to manage the day-to-day finances of the households so as to survive throughout the month while maintaining a surplus for an emergency or a month end outing. Hence, she becomes the financial planner of the family. On the other hand, fathers generate wealth and preserve it for the anticipated or inevitable upcoming big events in the future. They invest in gold, or fixed deposits or buy a house to preserve and grow this wealth. In this way, they become the wealth manager for the family. As we can observe, both the processes above include management of money. But, one of them is designated as Financial Planning and the other as Wealth Management. Is there any difference between them? If there is any, what? Before we move on and clear the air by differentiating the process and importance of financial planning and wealth management in achieving one’s financial goals, let us first understand all about this concept. Primarily, financial planning is a process which includes analysis of your existing resources, and devising a plan after determining your future financial goals. But majorly, it focuses on saving a part of your income by managing your daily expenditures to use it in the times of need and to have a secure life before or after retirement. Let us make it easy to understand with a real-life example. As you know, except for the business class, almost everyone receives a fixed monthly income. Out of it you need to pay monthly rent, your kid’s school fees, buy monthly provisions, pay your servant and might spend some on recreation and entertainment. To streamline the above process you can opt for financial planning. Apart from the management of all these expenses, it supports your necessity to save for future uncertainties on priority. It also plans for your retirement followed by other intermediary objectives such as buying car, children’s education, their marriage, and so on that appear over the life span. All of these are covered under financial planning and a financial planner is the person who can assist you in making a judicious use of your funds in optimal manner. Financial Planning majorly includes budgeting, cash flow management, and retirement planning. If financial planning is about constructing a strategy and executing it to achieve the set financial goals, then wealth management is a process that takes care of the wealth that is created as you execute your financial plan. As the name suggests, wealth management is predominantly about the preservation and enjoyment of one’s wealth along with the aim of its further growth. As a part of wealth management, investors hire a wealth manager who actively takes advantage of profit-making opportunities by investing in the financial options that suits the risk appetite of the investors. They work on multiple long-term and short-term strategies and invest clients’ large capital in the financial instruments such as mutual funds, commodities and real estate which multiply it with time. Capital gain assessment, estate planning, and other strategies fall under the gamut of wealth management. Thanks to the distributors and agents of the financial products, the concepts of Financial Planning and Wealth Management are often confused but, they are much different. Let us understand the differences between according to various attributes. When Do You Need Financial Planning and Wealth Management? The financial life of a person can be divided in three phases viz. Learning, Accumulation, and Retirement, where the need of financial planning and wealth management could arrive differently. As soon as a person starts earning he/she needs to keep a check on its expense-to-earnings ratio. The experts call it as the learning phase where you acquire the knowledge about how the financial system works. This knowledge helps you to follow a strategy that involves a process of calculating income from all the sources, calculating daily expenses and allocating your cash in a more rational manner to save for future needs. This process is known as financial planning. If you follow the procedure pertaining to your set financial plan, you’ll definitely be able to accumulate some wealth and hence, wealth management will come into the scene afterwards. In this phase, you start pursuing the financial plan and generate wealth simultaneously. At the initial stage, you might not need to manage your wealth, but as you reach the threshold of amassing money, the requirement for one may arise. Financial planning and wealth management work paralleling during the accumulation phase. It is expected that till you reach your retirement you might have piled up a hefty amount of wealth. As a result, you need to have a proper wealth management system. By then, financial planning will become just a need of the hour as it helps in taking decisions related to wise investment plans. We have been through the definitions, differences and the phases where financial planning and wealth management play their roles significantly. In a nutshell, we can say that wealth management is a part of financial planning which is generally required by the wealthy investors, but financial planning is life-long process that is followed by all the classes.